Well, this is neat surprise! This is one of the quilt tops I sent to Jackie last summer. They were fun to make. What size did you cut the center squares and sashings? Great pattern for a charity quilt. A beautiful quilt and such a great twist with all the block centers the same and the bright borders so different. I am happy that you guys got your walk and swimming time. sounds like a very nice weekend. 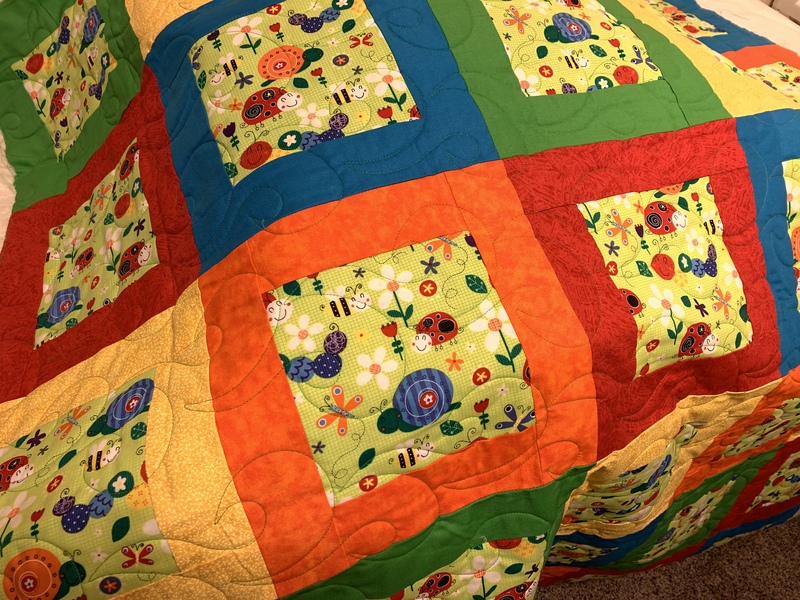 Love this quilt, so bright and colorful. Another awesome kid quilt. I was inspired to try out the Happy Blocks today. I have a bag of charm squares that I got from exchanges over the years, so I sorted out a bunch of fun kid types of prints and a bunch of polka dots in bright colors. I made 2 as a test and I think this will be another good scrappy donation quilt. Thanks for the ideas you share. Love the center material, so cute!! This pattern would make a cute I Spy quilt. You have probably already done that. I have the perfect layer cake for that…will need to make one. Thank you for all the great ideas! !